Scott Ludlam was leaving nothing out. In his strangely measured voice, he worked through a checklist of what he deemed to be the Abbott government’s failings: on drought, housing, climate change, online surveillance, the ABC, the broadband network, gay rights, trade unions, light rail, the shark cull, Medicare, schools funding, tertiary education, predatory capitalism. The West Australian senator described the government’s border protection policy as a “murderous horror”. Abbott saw WA as “Gina Rinehart’s inheritance”, Ludlam said. His relationship with miners and media owners was “awkward, and kind of revolting”. There was no applause. Somewhere in the senate chamber, a woman cleared her throat. The 44-year-old says he was politicised by his involvement with protests around the Jabiluka uranium mine in Kakadu National Park. After an unsuccessful marriage that ended in 1998, Ludlam says he spent New Year’s Eve alone that year, reading everything he could about the global nuclear industry. The other key area of Ludlam’s work has been internet freedom. His opposition to the internet filter and support of online freedom has seen him introduce a bill that would require law enforcement and intelligence agencies to get a warrant before accessing personal information about Australians online. Ludlam was among the first politicians to live tweet and conduct Q&As with his followers from the senate chamber. He puts all his speeches on SoundCloud and conducts “Ask Me Anything” sessions through reddit. He currently boasts more than 22,000 followers on Twitter and thousands of followers on Facebook. According to Steph Harmon, managing editor of the Junkee website that posted the now infamous speech, Ludlam’s online credentials helped. In his speech, Ludlam claimed Abbott was only helping the Greens. “Every time you open your mouth,” he said, “the Green vote goes up.” But the reality for the Greens is more patchy. Their vote at the federal election was way down. Their national vote is back below 10 per cent. On issues where they were once strong, they now struggle for traction. Of course, the Greens’ problems are deeper than this. They have lost Brown as the party’s guiding father. An increase in new parties is sapping votes that were once theirs. The outsider status they once had has been lost, but people confused by preferences worry if they are an effective protest vote. The large donation from Graeme Wood at the latest election that paid for significant advertising has been spent and may not be seen again. While not conceding that the Greens are facing major problems, Ludlam says he is aware the party cannot be content with its primary vote. He points to a number of factors holding the party back. “We’ve got one of the most powerful media organisations in the country that is dedicated to destroying us. We are also faced with a situation where a lot of money is flooding into politics from people like Clive Palmer, but also from the donations from the oil and gas and coal sector to Liberal and Labor. We don’t have that, so we actually have to get out there and speak to people face to face or all they will hear are Rupert Murdoch’s ideas of us. 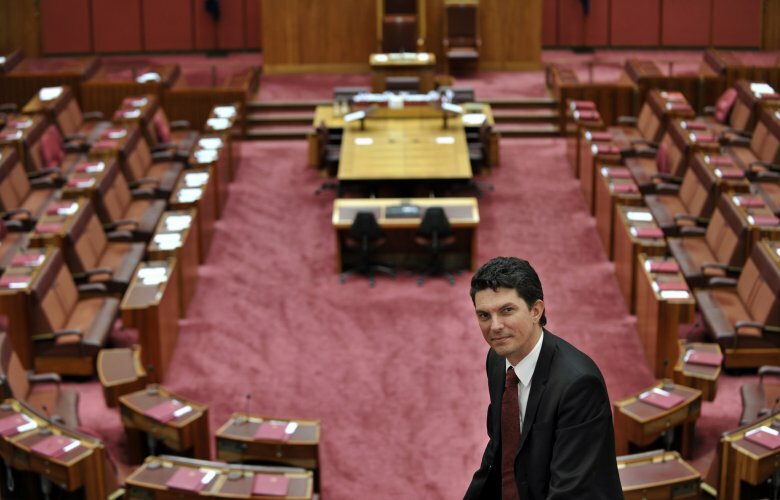 On March 4, the morning after Ludlam delivered his speech, it had failed to register a mention in any major media outlet. It wasn’t until the next day when Junkee and International Business Times picked up on the story, that it began to make serious waves online. Once the story became too big to ignore, the Murdoch press went on the attack. Chris Kenny described it as “vile” on Twitter and a piece in The Weekend Australian accused Ludlam of ‘‘debasing’’ himself and the WA election. Miranda Devine went further inThe Daily Telegraph, describing it as a “hate speech”.